Thornaby-on-Tees is a royal charter town, civil parish and former borough in North Yorkshire, England. Historically part of the North Riding of Yorkshire, Thornaby is situated on the south bank of the River Tees, directly south-east of Stockton-on-Tees and 4 mi (6 km) southwest of Middlesbrough. It has a population of 24,741 according to the 2011 census  and is in the unitary authority of Stockton-on-Tees. The name Thornaby came into existence about 800 AD when the land was given by Halfdene (Halfdan Ragnarsson), King of the Danes, to Thormod, one of his noblemen, hence "Thormods-by" – Thormod's farmstead. Although the -by suffix originally meant a farmstead, many of these grew into villages, taking the -by suffix with them in their names as with other villages in the area, such as Danby, Faceby, Ingleby, Maltby and Ormesby. There are other signs of Thornaby being a much older settlement. Traces of prehistoric man have been found, the earliest being a stone axe, 8 inches long, dating back to the Mesolithic Period (about 3000 BC). In 1926, a dugout canoe said to date from about 1600 – 1400 BC was found in the mud under 8 feet (2.4 metres) of water opposite Thornaby High Wood. An arrowhead of the Neolithic Period (about 3000 BC) was found in a garden on Thornaby Village Green. During the Battle of Hastings (1066), one of William the Conqueror's noblemen, Robert I de Brus, marched north with a garrison of men and occupied the area of Cleveland. William gave him those lands to control including Thornaby and Middlesbrough. King Sweyn II of Denmark, on 9 September 1069, defeated the Normans at York by killing the entire garrison of 3,000 men. William swore an oath to take revenge on Sweyn by destroying every house and dwelling in the lands under Sweyn's rule, leaving all the land in the north east of Yorkshire barren and bare. In the Domesday Book Thornaby is mentioned five times, Thornaby's first mention in the Domesday Book states:- "Robert Malet has these lands and they are waste." It appears that they remained undeveloped until the early 19th century as "Thurnaby waaste" is mentioned in a poem by Tennyson called "The Northern Farmer.". Over the centuries there have been a number of different spellings of the name Thornaby including Turmozbi, Tormozbi, Tormozbia and Thurmozbi. The form Thornaby first appears in 1665 and refers to old Thornaby village near the River Tees. In 1825, Thornaby, centred around St Peter's Church and the old village green was gradually overshadowed by the burgeoning newly named town of South Stockton which was 2 mi (3 km) away. South Stockton was on the Yorkshire side of the river Tees opposite Stockton-on-Tees, the name of this area originally being Mandale which was noted as a separate settlement from Thornaby. It was not until the local government act of 1863 that the district of South Stockton officially came into being. In 1825 South Stockton became the site of William Smiths pottery and the area quickly grew with the establishment of shipbuilding and engineering. Stockton Council made two attempts to take over the local board of South Stockton, first in 1869 and again in 1883, but without success. On 6 October 1892 South Stockton and Old Thornaby merged to form the municipal borough of Thornaby-on-Tees. The Anglican parish church on the village green is of 12th-century origin but a place of worship existed at the time of the Domesday Book of 1086. The unusual dedication to St. Peter ad Vincula ("St. Peter in chains") is derived from the ancient Basilica of San Pietro in Vincoli in Rome. The building, with a simple nave and a bell turret with two bells, was originally dedicated to St. Mary Magdalene. Grace Pace, the mother of Captain James Cook, was baptised at St. Peter's in 1702. It is said that Robert de Thormodbi, wounded in the Crusades at Acre, swore to raise a shrine to the Virgin Mary if he survived his wounds. He did, and as part of his wish a shrine niche to the Virgin Mary, lit by five sanctuary lamps, was placed in St. Peter's Church. Thornaby lies within the historic county boundaries of the North Riding of Yorkshire and was made a municipal borough in 1892. It was amalgamated with other boroughs including Middlesbrough and Stockton-on-Tees in 1968 to form the county borough of Teesside. Then, in 1974, it became part of the borough of Stockton-on-Tees in the new non-metropolitan county of Cleveland. Thornaby Town Council was created in 1995. Cleveland County (1974–1996) was abolished in 1996 under the Banham review. It was replaced with the single-tier unitary authorities of Middlesbrough, Stockton-on-Tees, Redcar and Cleveland and Hartlepool. The former areas of Cleveland County were returned to their original counties for ceremonial purposes with Stockton-on-Tees becoming the only local authority in the country to be split between two counties, Durham to the north of the river and Yorkshire to the south. The earliest known flying in Thornaby took place in 1912 when Matthew Young of the Vale Farm was paid 100 Gold Sovereigns for the use of a field for an airshow. Taking place on a Saturday afternoon in June or July, one of the main events was flying by Gustav Hamel, an early flying pioneer. The next known use was by the Royal Flying Corps who used the same fields between 1914 and 1918 as a staging post between Catterick and Marske aerodromes. In about 1925 negotiations began on the opening of a full-time aerodrome and in the late 1920s the Air Ministry constructed an airfield to the south of the town and the station which was the second permanent aerodrome to be built in Yorkshire (the first being Catterick) was opened on 29 September 1929. During the Second World War, Thornaby came under the control of 18 group, Coastal Command, before this however it had come under Flying Training, Fighter and Bomber Commands, and post-war under Reserve and Fighter Commands, at this time (post-war) it was also used by the Royal Air Force Regiment. During the war a variety of tasks were carried out from RAF Thornaby, such as, attacks on targets in Europe, anti submarine patrols, operational training, strikes against enemy shipping, leaflet dropping and air sea rescue operations. The last aircraft to leave R.A.F. Thornaby (Hawker Hunter F6s) left on 1 October 1958 and hope faded for the further use of Thornaby as a regional airport on 23 February 1962 when all but 60 acres (24 hectares) of land was purchased from the Air Ministry by Thornaby-on-Tees Borough Council. Work began almost immediately on transforming the airfield and throughout the 1960s and 1970s it was extensively redeveloped with modern housing, a shopping centre, sports centre and an industrial estate (the first in the region). Today many symbols of Thornaby's aeronautical past remain with streets, buildings and pubs using names of RAF aircraft, stations and personnel. The Bader School (built on the former airfield) on Kintyre Drive was named after and opened by Sir Douglas Bader on 10 November 1971. In 1976 a stained glass window in St Paul's Church on Thornaby Road was dedicated to the RAF at Thornaby. In 1997 a statue was erected on Thornaby Road, it is dedicated to all who served at RAF Thornaby. In 2007 a full-size replica Spitfire aircraft was erected on the roundabout at the junction of Thornaby Road, Bader Avenue and Trenchard Avenue. Hidden beneath the roundabout is part of one of the three runways which used to run east to west. On 10 November 2011 an R.A.F. Search and Rescue Sea King Helicopter paid a three-hour visit to Bader primary to help celebrate the 40th anniversary of Sir Douglas Bader opening the school. The day of activities included a visit by representatives from RAF Leeming, the Commanding Officer at Catterick Garrison, Middlesbrough Armed Forces Careers Office and the Cleveland Mountain Rescue Team. Of all the squadrons to have been based at RAF Thornaby during its operational period, "Thornaby's own" 608 (North Riding) squadron is probably the squadron best remembered by the townsfolk. It was formed at Thornaby on 17 March 1930 and went on to serve within both Coastal and Bomber Commands during the Second World War. After the war, on 10 May 1946 the squadron was re-formed at Thornaby and carried on in Reserve Command "at home" until the squadron disbanded for the last time on 10 March 1957. 608 (North Riding) Squadron's Standard, which was approved by the Queen and bears their battle honours, can be seen housed in York Minster under the Astronomical Clock where it was laid-up on 14 November 1959. The numerous items of glass and silverware which were presented to the squadron during their service are held by Middlesbrough Council, are housed in Middlesbrough Town Hall and are to be returned to the squadron should it ever re-form. The heavy engineering firm Head Wrightson was formerly a major employer in Thornaby-on-Tees. The town is served by Thornaby railway station. It is home to Durham University's Queen's Campus. This campus lies on the southern bank of the Tees on the Yorkshire side in Thornaby-on-Tees, so although it is part of Durham University, it is not in County Durham. Durham University was the second university to be approached due to Teesside University (who were first approached) not having the funds available necessary to run the university. Adjacent to the Queen's College campus of Durham University is Stockton Riverside College, a major provider of further education in the Tees Valley with around 10,000 full & part-time students. It too is not in Stockton, it actually lies on the southern banks of the river Tees in Thornaby on Tees. As of 2007[update], Thornaby is undergoing a major redevelopment and regeneration. The old Mandale Estate is being demolished and Mandale Park is being built to provide new affordable housing. The Pavilion shopping centre, off Allensway in Thornaby, has been redeveloped and was completed in autumn 2009. It is estimated to have created around 200 jobs and has brought improved leisure and shopping amenities to the local area. An official launch event was held in the Thornaby town centre on Saturday 25 April 2009. There is a council owned leisure centre and library, several banks, a post office, two medical practices, chemists, an Asda supermarket, many other shops and a small market on Thursdays. In January 2014 a McDonald's drive through restaurant and an Asda petrol filling station opened on the former Tristar Neasham Site. Thornaby won a number of awards in 2008; it won the silver gilt award for best small cities, with its Northumbria in Bloom entry, which was repeated in 2011. Thornaby Cemetery has won the green flag award and is continuing to improve after winning the Cemetery of the Year award in 2006. Despite this status having been lost in 2006, due to complaints concerning illicit use of the cemetery, the Green Flag status was restored by 2011. In 2012 the Town Council purchased Thornaby Town Hall from Stockton Borough Council with the hope of enabling the building and the surrounding area to be restored. The Hall (which dates from 1890-2) is a prominent landmark, but has been largely unoccupied since the 1968 amalgamation. Teesside Park is also in Thornaby; it was formerly a racecourse and is now a shopping park. Thornaby held its eleventh Yorkshire Day event in August 2017. The annual Thornaby Show takes place at the beginning of September, it is estimated that more than 10,000 people turn up over the course of the day. The A19/A174 Parkway junction scheme began on 19 May 2014 and has created a dual carriageway which aims to reduce traffic towards Thornaby and Ingleby Barwick. The scheme has an estimated cost of £7.8 million and will be completed by 30 April 2015. Grace Pace (the mother of Captain James Cook). Award-winning author Pat Barker lived in Millbank Lane and is best known for her Regeneration Trilogy of books about the First World War. She won the Man Booker Prize in 1995. TV-Personality Holly Hagan, one of the original stars from MTV show Geordie Shore was born in Thornaby. Actor, Richard Griffiths was born in Thornaby and is best known for his role as Vernon Dursley in the Harry Potter movies. He won many awards for his acting in the film The History Boys. Paul Curran – the championship cyclist was born in Thornaby. Max Jones, pupil at Robert Atkinson school, was a seven time Olympic athletics coach and was the GB Team leader at the Sydney and Athens Olympic Games. Max was the Performance Director for UK Athletics 1997 to 2005. Norma Farnes was born and bred in Thornaby. She went to London and ended up as Spike Milligan's and Eric Sykes's manager. Norma has edited and written, several successful books. ^ "Town population 2011". Retrieved 24 July 2015. ^ "Stockton on Tees Heritage Strategy" (PDF). Stockton on Tees Borough Council. 2011. p. 23. Archived from the original (PDF) on 27 April 2012. Retrieved 15 December 2011. ^ "Place-names in The Danelaw". Retrieved 15 December 2011. ^ "A19/A174 Parkway Junction Improvement, Middlesbrough". Highways Agency. Retrieved 15 April 2015. ^ "Captain James Cook 1728 – 1779: Early Life". The Captain Cook Birthplace Museum. 2009. Retrieved 6 June 2009. ^ Turnbull, Simon (15 September 2002). "Jones takes Britain to the Max". The Independent. Retrieved 19 July 2018. ^ Sanderson, Mark (8 December 2003). "In the gutter, looking at the stars". The Daily Telegraph. Retrieved 19 July 2018. Wikimedia Commons has media related to Thornaby-on-Tees. North Yorkshire is a non-metropolitan county and largest ceremonial county in England. It is located primarily in the region of Yorkshire and the Humber but partly in the region of North East England. The estimated population of North Yorkshire was 602,300 in mid-2016. 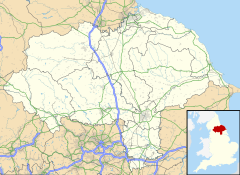 Cleveland is an area in the north-east of England. Its name means literally "cliff-land", referring to its hilly southern areas, which rise to nearly 1,500 ft (460 m). Historically, Cleveland, as a geographic area within the North Riding of Yorkshire, was located entirely to the south of the River Tees and its largest town was Guisborough, until the rise of Middlesbrough in the 19th century. The River Tees is in northern England. It rises on the eastern slope of Cross Fell in the North Pennines, and flows eastwards for 85 miles (137 km) to reach the North Sea between Hartlepool and Redcar near Middlesbrough. Stockton-on-Tees is a market town in County Durham, England. The town has a population of 85,000, with a population of 195,000 in the wider borough, according to 2017 estimates. Middlesbrough is a large post-industrial town on the south bank of the River Tees in North Yorkshire, northeast England, founded in 1830. The local council, a unitary authority, is Middlesbrough Borough Council. The 2011 Census recorded the borough's total resident population as 138,400 and the wider urban settlement with a population of 174,700, technically making Middlesbrough the largest urban subdivision in the ceremonial county of North Yorkshire. Middlesbrough is part of the larger built-up area of Teesside which had an overall population of 376,333 at the 2011 Census. The North Riding of Yorkshire is one of the three historic subdivisions (ridings) of the English county of Yorkshire, alongside the East and West ridings. From the Restoration it was used as a lieutenancy area, having been part of the Yorkshire lieutenancy previously. The three ridings were treated as three counties for many purposes, such as having separate quarter sessions. An administrative county was created with a county council in 1889 under the Local Government Act 1888 on the historic boundaries. In 1974 both the administrative county and the Lieutenancy of the North Riding of Yorkshire were abolished, being succeeded in most of the riding by the new non-metropolitan county of North Yorkshire. Teesside is the conurbation in the north east of England around the urban centre of Middlesbrough that is primarily made up of the towns Billingham, Redcar, Stockton-on-Tees, Thornaby and surrounding settlements near the River Tees. It was the name of a local government district between 1968 and 1974—the County Borough of Teesside. Teesside remains an important centre for heavy industry, although the number of people employed has declined. Traditional industries, primarily steelmaking and chemical manufacture, have been replaced to a large extent by high technology activities, science development and service sector roles. BBC Tees is the BBC Local Radio service for the English areas of Teesside, County Durham and some of North Yorkshire. It broadcasts from its studios in Middlesbrough on 95.0 and 95.8 (Whitby) FM. The Borough of Stockton-on-Tees is a unitary authority and borough in the north east of England, with a population of 191,600 shown in the 2011 census. It is split between the ceremonial counties of Durham and North Yorkshire by the River Tees. Stockton South is a constituency represented in the House of Commons of the UK Parliament since June 2017 by Paul Williams, a Labour MP. Thornaby railway station serves the town of Thornaby-on-Tees and also much of Stockton-on-Tees. It is located in the borough of Stockton-on-Tees and in the ceremonial county of North Yorkshire. It is currently operated by TransPennine Express. Teesside Park is a retail superstore and leisure development in Thornaby-on-Tees, built in 1988. Located just off the A66 near the A66/A19 interchange, it is split between the unity authorities of Stockton-on-Tees and Middlesbrough with the line of the Old River Tees, which runs down the middle of the development, forming the boundary between the two authorities. The development has an eye-catching central building that was constructed in 2008. Stillington is a village in County Durham, England, northwest of Stockton-on-Tees. Middlesbrough Council, formerly known as Middlesbrough Borough Council is the local council of Middlesbrough. It is a unitary authority and borough council in the Tees Valley sub-region of the North East of England. It is based on the town of Middlesbrough, which is often considered to spread outside the borough boundaries into neighbouring Redcar and Cleveland with a total built-up population of 174,700; the borough extends southwards to a semi-rural area. Whilst part of North Yorkshire for ceremonial purposes, it is in the region of North East England. It had a resident council population in 2001 of 134,855. A 2006 mid-year estimate suggests the Borough to have a population of 138,400. The borough council unsuccessfully bid to achieve city status in 2012, to celebrate the Queen's Diamond Jubilee. The Teesdale Way is a long distance walk between the Cumbrian Pennines and the North Sea coast of North Yorkshire in England. The walk is 100 miles (160 km) in length; it links in with other long distance walks such as the Pennine Way and the E2 European Walk between Harwich and Stranraer. Royal Air Force Thornaby or more simply RAF Thornaby was a former Royal Air Force Station located in the town and Borough of Thornaby-on-Tees, North Yorkshire, England. Fighter Command, Bomber Command and Coastal Command all operated from the base over its history, but its stint under Coastal Command is what the base was notable for, particularly in the air-sea rescue environment and the development of the Thornaby Bag. This was an emergency bag dropped to downed aircrew at sea and contained food, cigarettes and drink. Teesdale Business Park is a major business park on the former site of Head Wrightsons' Teesdale works in Thornaby-on-Tees in the borough of Stockton-on-Tees and Ceremonial County of North Yorkshire, England. The park was redeveloped by the Teesside Development Corporation. The area is immediately north of Thornaby railway station, bounded by the River Tees and the Tees Valley Line . It is a short distance from Stockton-on-Tees town centre and is connected to Stockton via the Victoria Bridge, Teesquay Millennium Bridge footbridge, Princess of Wales Bridge and Infinity Bridge footbridge. Teesside was, from 1968 to 1974, a local government district in northern England. It comprised a conurbation that spanned both sides of the River Tees from which it took its name. The district had the status of a county borough and so was independent of the county council of the North Riding of Yorkshire, in which it was geographically located. Tees Marshalling Yard was a railway marshalling yard, used to separate railway wagons, located near Middlesbrough in North Yorkshire, Northern England.